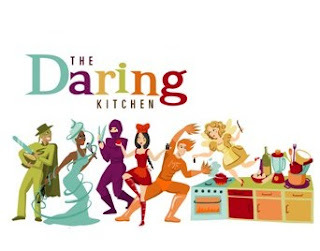 The 2010 March Daring Bakers' challenge was hosted by Jennifer of "Chocolate Shavings" who chose "Orange Tian" as the challenge for this month, a dessert based on a recipe from Alain Ducasse’s Cooking School in Paris. 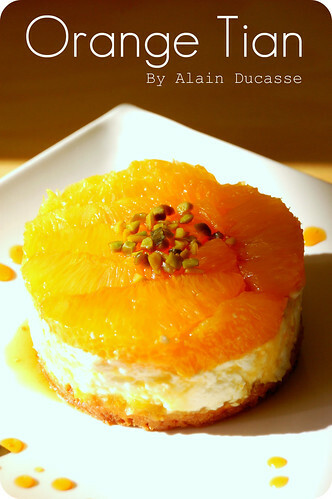 Ducasse's "Orange Tian" recipe was very easy to prepare, but it was nonetheless time consuming. After two days of marmelade-, pâte sablée- and caramel-making we were finally able to indulge ourselves in the most delightful and refined fruit dessert that I have ever made. 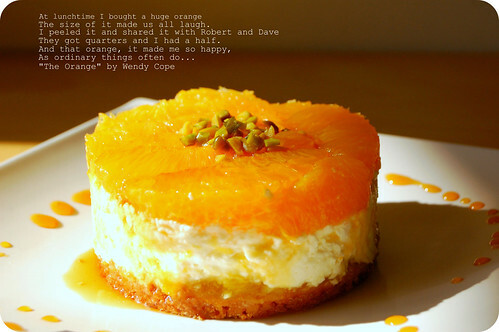 At first, I wanted to make my tian with blood oranges, but as my favorite supermarket had none on sale, I had to take Navel oranges instead. So, I followed the recipe to the letter. I only added my personal touch to the pâte sablée which I flavored with ground Mahlep, a Turkish and Greek spice. 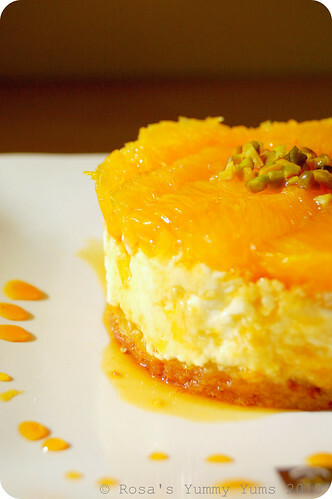 This dessert is really exquisite, not too sweet and so fresh. 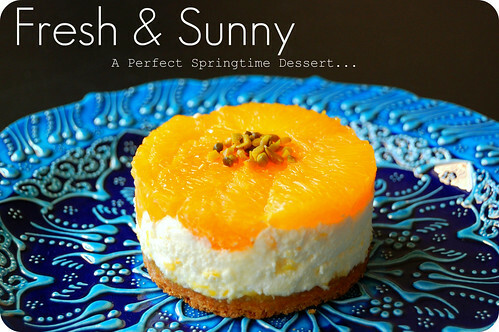 The oranges bring a wonderfully fruity touch, the cream filling is very delicate tasting and the sweet and buttery pastry crust (pâte sablée) brings a marvelous as well as contrasting flakiness to the whole. A perfectly balanced dessert. Divine! • Cookie cutters . Ideally, you should have about 6 cookie cutters to build the desserts in and cut the circles of dough (see photo). The cookie cutters will be the size of your final dessert, so they should be the size of an individually-sized tart mold. 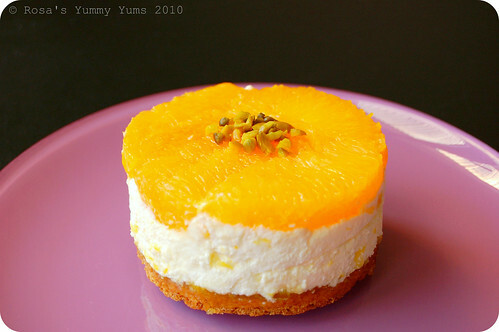 If you don’t have round cookie cutters you could use an individually-sized cheesecake mold wit hout its base. 1. Put the flour, baking powder, ice cold cubed butter and salt in a food processor fitted with a steel blade. 2. In a separate bowl, add the eggs yolks, vanilla extract and sugar and beat with a whisk until the mixture is pale. Pour the egg mixture in the food processor. 3. Process until the dough just comes together. If you find that the dough is still a little too crumbly to come together, add a couple drops of water and process again to form a homogenous ball of dough. Form into a disc, cover with plastic wrap and leave to rest in the fridge for 30 minutes. 4. Preheat your oven to 350 degree Fahrenheit. 5. Roll out the dough onto a lightly floured surface until you obtain a ¼ inch thick circle. 6. Using your cookie cutter, cut out circles of dough and place on a parchment (or silicone) lined baking sheet. Bake for 20 minutes or until the circles of dough are just golden. 1. Finely slice the orange. Place the orange slices in a medium-sized pot filled with cold water. Simmer for about 10 minutes, discard the water, re-fill with cold water and blanch the oranges for another 10 minutes. 2. Blanch the orange slices 3 times. 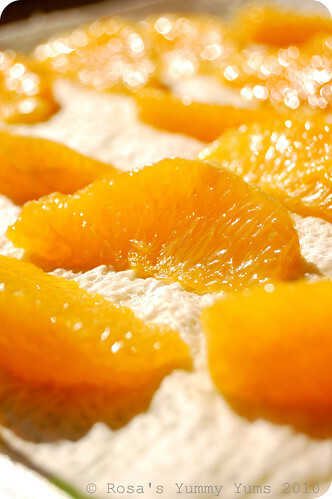 This process removes the bitterness from the orange peel, so it is essential to use a new batch of cold water every time when you blanch the slices. 3. Once blanched 3 times, drain the slices and let them cool. 4. Once they are cool enough to handle, finely mince them (using a knife or a food processor). 5. Weigh the slices and use the same amount of granulated sugar . If you don’t have a scale, you can place the slices in a cup measurer and use the same amount of sugar. 6. In a pot over medium heat, add the minced orange slices, the sugar you just weighed, the orange juice and the pectin. Cook until the mixture reaches a jam consistency (10-15 minutes). 7. Transfer to a bowl, cover with plastic wrap and put in the fridge. 1. Cut the oranges into segments over a shallow bowl and make sure to keep the juice. Add the segments to the bowl with the juice. 1. Place the sugar in a pan on medium heat and begin heating it. Once the sugar starts to bubble and foam, slowly add the orange juice. 2. 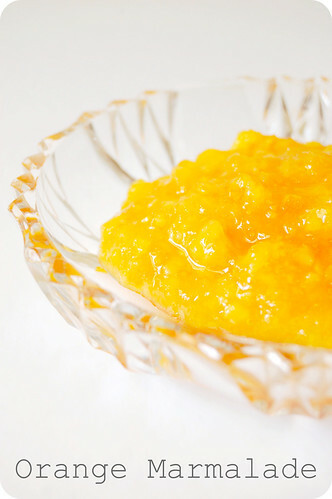 As soon as the mixture starts boiling, remove from the heat and pour half of the mixture over the orange segments (Reserve the other half of the caramel mixture in a small bowl — you will use this later to spoon over the finished dessert. When the dessert is assembled and setting in the freezer, heat the kept caramel sauce in a small saucepan over low heat until it thickens and just coats the back of a spoon - about 10 minutes. You can then spoon it over the orange tians). Be very careful when making the caramel — if you have never made caramel before, I would suggest making this step while you don’t have to worry about anything else. Bubbling sugar is extremely, extremely hot, so make sure you have a bowl of ice cold water in the kitchen in case anyone gets burnt! 1. In a small bowl, add the gelatine and hot water, stirring well until the gelatine dissolves. Let the gelatine cool to room temperature while you make the whipped cream. 2. Combine the cream in a chilled mixing bowl. Whip the cream using a hand mixer on low speed until the cream starts to thicken for about one minute. 3. Add the confectioner sugar. Increase the speed to medium-high. Whip the cream until the beaters leave visible (but not lasting) trails in the cream. 4. Then add the cooled gelatine slowly while beating continuously. Continue whipping until the cream is light and fluffy and forms soft peaks. 5. Transfer the whipped cream to a bowl and fold in the orange marmalade. Use an ice cold bowl to make the whipped cream in. You can do this by putting your mixing bowl, cream and beater in the fridge for 20 minutes prior to whipping the cream. 1. Line a small tray or baking sheet with parchment paper or a silicone sheet. Lay out 6 cookie cutters onto the parchment paper/silicone. 2. Drain the orange segments on a kitchen towel. 3. Have the marmalade, whipped cream and baked circles of dough ready to use. 4. 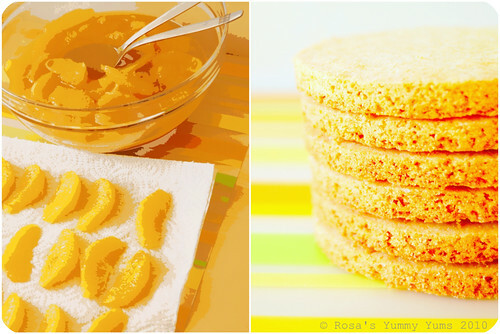 Arrange the orange segments at the bottom of each cookie cutter (Make sure the segments all touch either and that there are no gaps and that they fit snuggly and look pretty as they will end up being the top of the dessert. Arrange them as you would sliced apples when making an apple tart). 5. Once you have neatly arranged one layer of orange segments at the bottom of each cookie cutter, add a couple spoonfuls of whipped cream and gently spread it so that it fills the cookie cutter in an even layer. Leave about 1/4 inch at the top so there is room for dough circle. 6. Using a butter knife or small spoon, spread a small even layer of orange marmalade on each circle of dough. Carefully place a circle of dough over each ring (the side of dough covered in marmalade should be the side touching the whipping cream). 7. Gently press on the circle of dough to make sure the dessert is compact. 8. Place the desserts to set in the freezer to set for 10 minutes. 9. Using a small knife, gently go around the edges of the cookie cutter to make sure the dessert will be easy to unmold. 10. Gently place your serving plate on top of a dessert (on top of the circle of dough) and turn the plate over. Gently remove the cookie cutter, add a spoonful of caramel sauce and serve immediately. Being quite well documented on the rich culinary heritage of Turkey as well as being a sucker for the foods of that country, it was not hard for me to write down a detailed list (big cevze, sahlep, Turkish delights, a traditional turquoise plate, pastirma, etc...) of what I was hoping that she would find in that magnificent place which I'd love to visit one day. As expected, Jessica came back with a bag full of goodies. I was so happy to find most of the things I asked for (Thanks so much, Jessica!). Among the things which she bought in Instanbul was a meat speciality that I was particularly looking forward to tasting: "Pastirma". 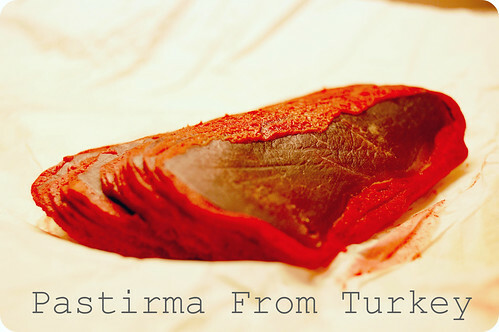 "Pastirma" is a distinctively spicy, air-dried cured beef treat originating from Armenia that is made by pastirmacilik (pastirma butchers) all around Turkey and which is thinly sliced with a massive razor-sharp cleaver. 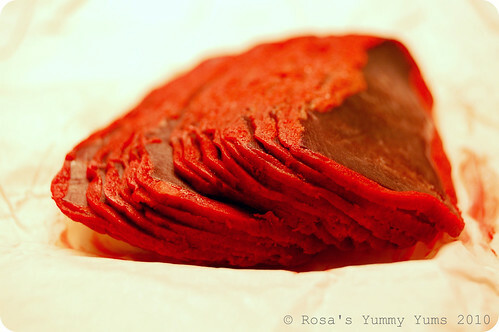 In certain ways, it is a bit similar to our Swiss dry meat (Bündnerfleisch), the difference being that the pressed meat nuggets are covered with a very fragrant oxblood-red paste called çemen (lit., 'fenugreek') prepared with ground cumin, fenugreek, paprika and garlic. Apparently, there are more than twenty types of "Pastirma". The most expensive pieces are cut from the fillet and sirloin as well as from the leg, shank and shoulder. The less expensive pieces are cut from the flank, neck and brisket. No matter the cut, all the meat is treated the same way (air-dried first, them smothered in çemen and left to cure). Nowadays, various meats are also used, including camel (the most prized), pork, lamb, goat and water buffalo. According to the legend, Turkic horsemen of Central Asia used to preserve meat by placing slabs of it in the pockets on the sides of their saddles, where it would be pressed by their legs as they rode. "Pastirma" is usually considered Turkish, though it is produced and consumed in a wide area of Eastern Europe and the Middle East (Egypt, Palestine, Armenia, Syria, Lebanon and Cyprus). The "Pastirma" that we tested was delicious. We really loved that unique tasting dried meat that somehow reminded us a little of Pastrami (the word pastrami, although used for a differently prepared type of meat goes back via Yiddish - פּאַסטראָמע pastrómeh - to "Pastirma") as it has a similar spicy flavor (The comparison stops there, though since texture-wise it has nothing in common with the Jewish speciality). Imagine eating Bündnerfleisch (Swiss dry cured meat) together with highly seasoned paste, well that's exactly how it tastes! Peter M. at "Kalofagas" shares his recipe with us. 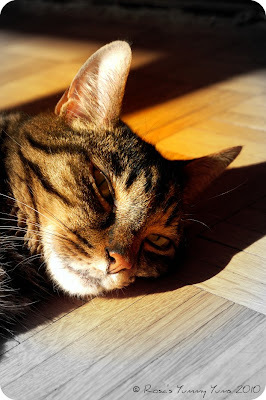 To submit your kitty picture(s), you can either leave a message in his blog's comment section (with your permalinks) or contact him via e-mail without forgetting to give all the needed information. After his trip to the healer, Fridolin is doing well. We have stopped giving him cortisone, but he has a lot of appetite, doesn't vomit his food anymore and is full of energy as well as sweeter than ever. 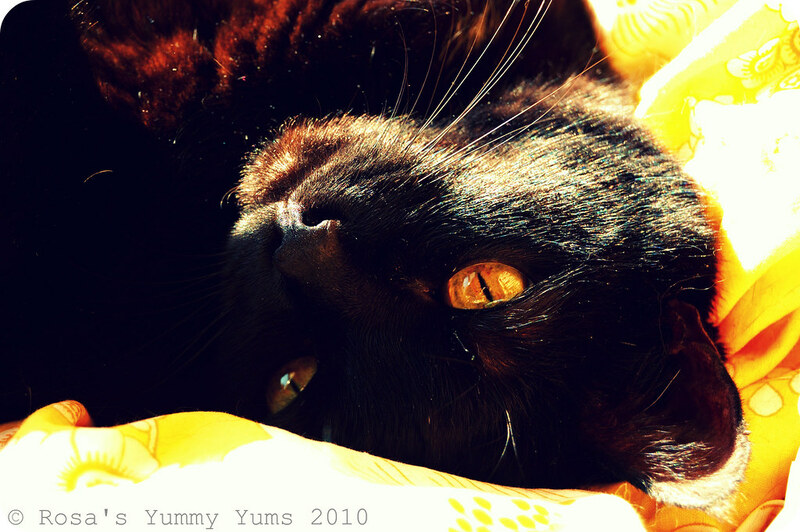 I felt uneasy and shifty like a tiger in a cage, roaming up and down the apartment in search of a fulfilling recipe. I wanted something transcending and soul-uplifting. As it is many times the case, I found what I was looking for in Dorie Greespan's "Baking From My Home To Yours". 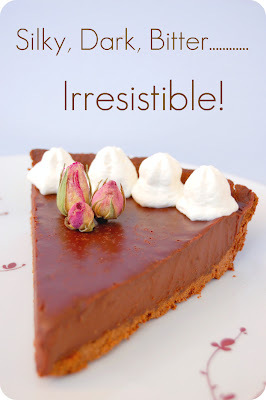 As I needed to savor a chocolate-based tart with character and a strong taste of chocolate, I was naturally drawn to her "Dark chocolate Tart" recipe which's name sounded so promising to me. This sophisticated, yet simple tart is an irresistible pastry that any dessert freak should have made at least once. The taste of chocolate is exhaliratingly heady, strong and bitter, the crust is so flaky and buttery and the filling is so sleek, rich, smooth and the cocoa nibs add a wonderfully crunchy contrast. It can't get any better! Recipe taken from "Baking From My Home To Yours" by Dorie Greenspan and slightly adapted by Rosa @ Rosa's Yummy Yums 2010. 1. Put the flour, cocoa powder, sugar and salt in a food processor and pulse a few times to combine. 3. Stir the yolk with a fork and add it a little at a time, pulsing after each addition. 4. Process in long pulses (10 seconds each) until the dough comes together in clumps and curds. 5. Turn the dough to a lightly floured surface a knead briefly in order to incorporate the dry ingredients that might have escaped the mixing. 6. Lightly butter a 9-inch (22cm or you could make several tartlets) fluted tart pan with a removable bottom and press the dough evenly over the bottom and up the sides of the pan. 7. Freeze the crust for at least 30 minutes (longer is preferable). 8. Centre a rack in the oven and preheat the oven to 180° C (350° F). 9. Butter a piece of parchment paper and fit the paper, buttered side down, tightly against the crust. 10. Put the tart pan on a baking tray and bake for 25 minutes. 11. Carefully remove the paper. If the crust has puffed, press it down gently with the back of a spoon. 12. Bake for another 8 minutes or so. 13. Transfer the tart pan to a rack and cool the crust completely before filling. 1. Put the chopped chocolate in a heatproof bowl and have a whisk at hand. 2. Bring the cream to a boil, then pour half of it over the chocolate and let it sit for 30 seconds. Working with the whisk, very gently stir the chocolate and cream together in small circles, starting at the centre of the bowl and working your way out. 3. Pour in the remainder of the cream and blend it into the chocolate, using the same circular motion. 4. When the ganache is smooth and shiny, stir in the butter piece by piece and add the cocoa nibs. 5. 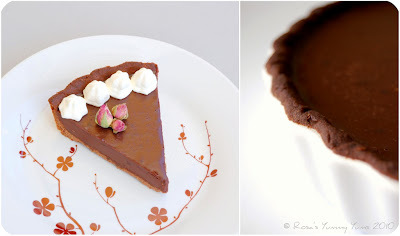 Pour the ganache into the crust and gently turn the pan from side to side to even the ganache. 6. 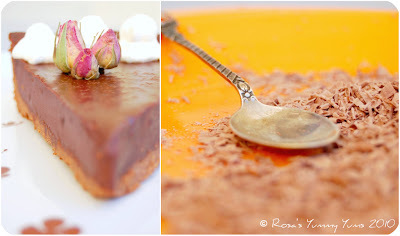 Refrigerate the tart for 30-40 minutes to set the ganache. 7. 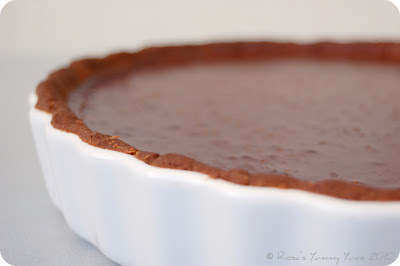 Remove the tart from the fridge and keep it at room temperature until serving. 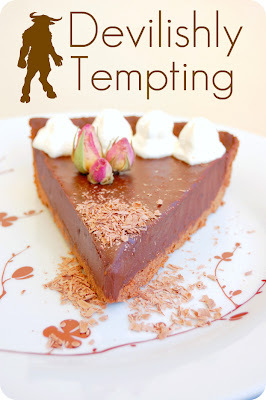 Always remember to use the best chocolate as the taste of your tart will depend on it. Don’t stir the ganache any more than you must to blend the ingredients – the less you work it, the darker, smoother and shinier it will be. Purists will want to enjoy the tart at room temperature and au naturel, but you can of course serve it cold, served straight out of the fridge. 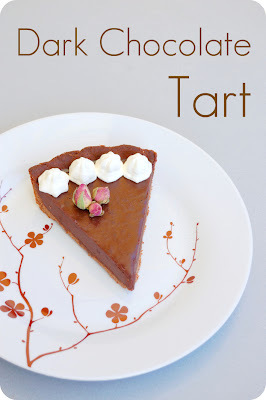 Serve that tart the day it is made or latest the next day. Eat it alone or accompanied by whipped cream or ice cream (vanilla, peanut butter, pecan, walnut, caramel, etc...). Recette tirée du livre "Baking From My Home To Yours" par Dorie Greenspan et légèrement adaptée par Rosa @ Rosa's Yummy Yums 2010. 1. Mettre la farine, la poudre de cacao, le sucre et le sel dans un mixer et pulser afin de bien mélanger. 2. Ajouter le beurre et pulser jusqu'à ce que vous obteniez des petits morceaux de beurre (certains de la taille d'un flocon d'avoine et d'autres de la taille d'en petit pois). 3. Mélanger le jaune d'oeuf à la fourchettte et l'ajouter au mélange petit à petit, en pulsant après chaque ajout. 4. Pulser plusieurs fois pendant 10 secondes, jusqu'à ce que la pâte commence à se rassembler. 5. Mettre la pâte sur une surface de travail farinée et pétrir légèrement afin d'incorporer tous les ingrédients qui se sraient échappés lors du mixage. 6. Beurrer légèrement une plaque flûtée (avec fond amovible) de 22cm (ou plusieurs moules à tartelettes) et presser la pâte dans le moule afin de bien le tapisser. 7. Mettre le moule au congélateur pendant 30 minutes ou plus. 8. Placer une grille au centre du four et le préchauffer à 180° C.
9. Beurrer une feuille de papier sulfurisé et mettre le côté beurrer sur la croûte(bien recouvrir). 10. Mettre la pâte à cuire pendant 25 minutes. 11. Enlever délicatement la feuille de papier sulfurisé. Si la pâte à gonflé, l'applatir avec le dos d'une cuillère. 12. La cuire encore pendant 8 minutes ou plus. 13. Mettre la pâte à refroidir (complétement) sur une grille. 1. Mettre le chocolat haché dans un bol moyen et préparer un fouet. 2. Faire bouillir la crème et verser la moitié sur le chocolat. Le laisser reposer 30 secondes, puis bien mélanger au fouet de manière circulaire (ne pas battre/voir remarques). 3. 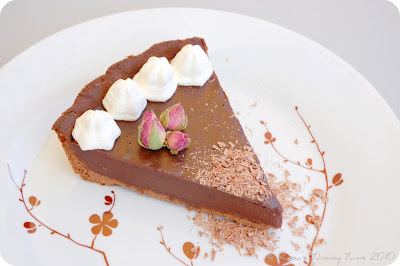 Verser le reste de crème et bien l'incorporer au mélange chocolatté, en mélangeant de manière circulaire. 4. Quand la ganache est lisse et brillante, ajouter le beurre morceau par morceau, puis le grué de cacao. 5. Verser la ganache dans la croûte et secouer légèrement afin de lisser. 6. Mettre au frigo pendant 30-40 minutes afin que la ganache se solidifie. 7. Retirer du frigo et laisser la tarte à température ambiante avant de servir. Achetez toujours du chocolat de bonne qualité. La saveur de votre tarte en dépendra. Ne mélangez pas trop la ganache autrement elle perdra de sa couleur foncée et ne sera plus lisse et brillante. 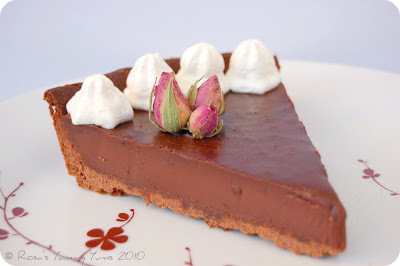 Les puristes voudront consommer cette tarte à température ambiante, mais vous pouvez aussi la consommer froide. Servir cette tarte le jour de sa fabrication ou au plus tard le jours suivant. Vous pouvez la manger seule, avec de la crème chantilly ou avec de la glace (à la vanille, au beurre de cacahuète, aux pécans, aux noix, caramel, etc...).